Overcast. Low 38F. Winds WNW at 5 to 10 mph..
Overcast. Low 38F. Winds WNW at 5 to 10 mph. Cheyenne Maddox runs in the 100 meter hurdles. Tristan Gibson runs in the relay. Gavin Mills leaps in the long jump. 4x100 Relay – Libien Becker, Dawson Allen, Keeley Bake, Ryder Meyer 1st -44.81; Gavin Mills, Miguel Perez, Carter McDowell, Conor Murray 9th-48.93; Kolter Bouma, Kaelob Flores, Thomas Troy, Tristan Gibson 13th-52.53; Rhett Donnelly, Michael Wambach, Josiah Pearson, Blake Schweigert 16th -56.62. 4x400 Relay – Libien Becker, Gavin Mills, Ryder Meyer, Dawson Allen 1st-3:40.08; Keeley Bake, Clay Paddock, Kayson Brown, Carter McDowell 4th-3:59.25; Michael Wambach, Tristan Gibson, Conor Murray, Levi Gibson 7th-4:04.48. Kolter Bouma, Rhett Donnelly, Josiah Pearson, Kaelob Flores 11th -4:25.49. Shot Put – Josiah Pearson 13th -36-.06, Kolter Bouma 16th-35-10, Kaelob Flores 29th-32.02, Rhett Donnelly 50th-28-00.05, Thomas Troy 51st-27.06.50, Josh Norheim 61st-20-08, Blake Schweigert 62nd -20.04.50. Discus – Kolter Bouma 5th-115-04, Josiah Pearson 18th-93-04, Kaelob Flores 20th-92-05, Rhett Donnelly 42nd-76-03, Thomas Troy 43rd -73-08, Josh Norheim 58th -51-03. 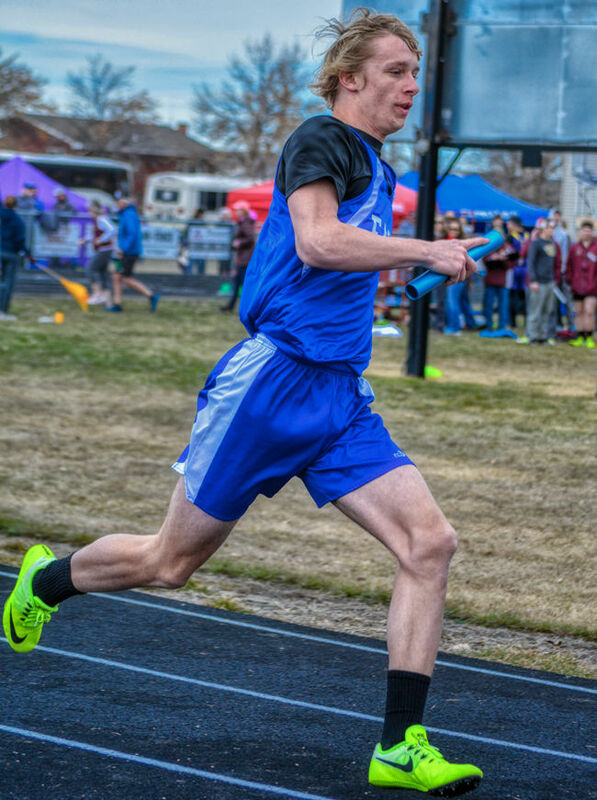 Javelin – Kaelob Flores 12th -115-04, Kolter Bouma 15th-113-04, Josiah Pearson 21st-108-10, Tristan Gibson 27th-100-05, Rhett Donnelly 36th-94-07, Thomas Troy 59th-71, Josh Norheim 60th-68-08. High Jump – Levi Gibson 5th-5-08.00, Kayson Brown 7th-5-04.00, Conor Murray 15th- 5-00.00. Pole Vault – Levi Gibson 1st-12-06.00, Kayson Brown 6th-9-00.00. Long Jump – Keeley Bake 1st- 20-06.75, Levi Gibson 4th-19-09.50, Gavin Mills 5th-19-08.75, Conor Murray 26th-16-08.00. Triple Jump – Keeley Bake 3rd-39-09.50, Gavin Mills 8th-38-00.00, Carter McDowell 10th-37.01.00, Levi Gibson 12th-35-10.75. 100 Meters – Shelby Schweigert 2nd -13.62, Natalie Kolste 9th-13.99, Reegan Carper 22nd -14.67, Jaileyana Schwedler 22nd -14.67, Lily Purcell 52nd -28.59. 200 Meters – Shelby Schweigert 8th-29.93, Kaylee Bouma 19th -32.47. 400 Meters – Shelby Schweigert 2nd-1:07.74, Alexa Johnson 5th -1:11.03. 800 Meters – Avery Pitcher 2nd-2:41.31, Alexa Johnson 4th -2:46.07, Kinsie Schenk 8th-3:08.12. 1600 Meters – Avery Pitcher 2nd -6:14.78, Kinsie Schenk 9th-7:01.00. 100m Hurdles – Cheyenne Maddox 2nd -17.32, Reegan Carper 7th -18.54. 300m Hurdles – Cheyenne Maddox 9th -56.44, Reegan Carper 10th-57.01, Kyler Bake 13th-58.99. 4x100 Relay – Shaylee Grigsby, Natalie Kolste, Cheyenne Maddox, Shelby Schweigert 2nd – 53.85; Jaileyana Schwedler, Kaylee Bouma, Kyler Bake, Mykenna Rosenkrance 9th-57.91. 4x400 Relay – Natalie Kolste, Alexa Johnson, Avery Pitcher, Shelby Schweigert 3rd -4:38.70. 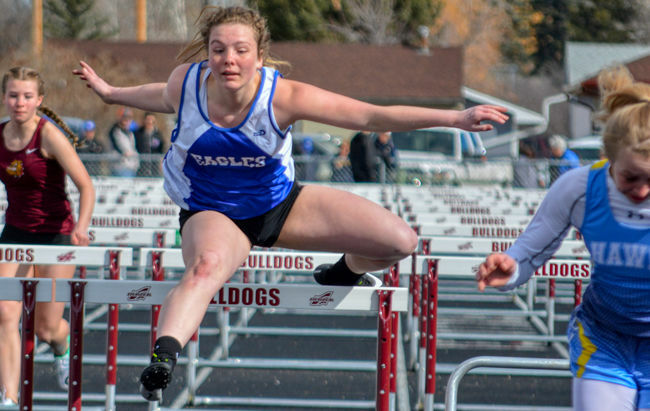 Shot Put – Sami DeBolt 15th-23-02, Mykenna Rosenkrance 18th -21.08.50, Natalie Kolste 19th -21.04.50, Alexa Johnson 20th -20-07.00. Discus – MyKenna Rosenkrance 7th-66-07, Sami DeBolt 13th-60-02, Lily Purcell 22nd-14-04. Javelin – MyKenna Rosenkrance 8th-82-10, Kaylee Bouma 11th -74-05, Sami DeBolt 19th-62-09, Lily Purcell 26th -8-03. High Jump – Shaylee Grigsby 6th-4-04.00, Jaileyana Schwedler 7th-4-04.00. Long Jump – Kyler Bake 11th -13-08.50, Kaylee Bouma 13th -13-03.75, Jaileyana Schwedler 16th -13-02. Triple Jump – Natalie Kolste 1st -31-06, Kyler Bake 2nd-29-11.